Universal is re-attempting to re-reimagine Battlestar Galactica. A big-screen version of the sci-fi warhorse has been in the works since 2009, with director Bryan Singer working on a version that is a continuation neither of the 1978 series with Lorne Greene, nor of the 2004 TV remake that had Edward James Olmos, Katee Sackhoff, and scores of fans disappointed with the ending. Singer has now left the project, vanishing into thin air because… um… he was an angel or something! Trust us, it makes sense. But the studio will soldier on with screenwriter Jack Paglen, whose credits include the upcoming Transcendence and the first draft of Ridley Scott’s Prometheus sequel. Presumably, the same basic elements—i.e. the remnants of humanity fly through space on a ship named Galactica and fight robots called Cylons—will persevere through this third incarnation. But whether the Cylons will look like metal behemoths, or Grace Park, or some third thing (Kittens? Silverware? Marshmallows?) hasn’t yet been announced. 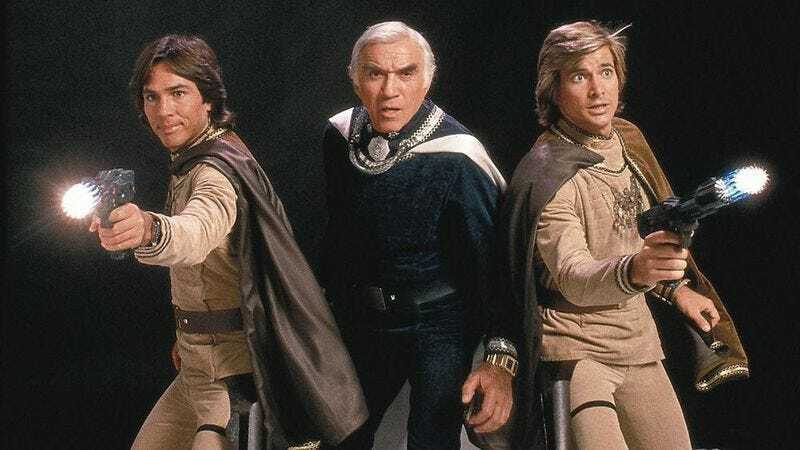 Maybe it’ll turn out that Paglen and an as-yet-unnamed director are actually living in the distant past, so that this movie will actually be the first iteration of Battlestar Galactica.